You deserve a smile you feel proud of, and at Maplewood Dental Associates, our mission is to help you achieve one through comprehensive, quality dental care. As a leading dental practice serving the Maplewood, MN area, we're proud to provide a wide range of dental treatments and services, including tooth extraction. But don't worry – tooth extraction isn't nearly as bad as you may think! Tooth extraction – the process of surgically removing a tooth from the mouth – sometimes offers the best option for achieving a great smile, and while we try to help our patients keep their natural teeth whenever possible, sometimes extraction is the best option. Tooth extraction is a minor surgical procedure, with extra emphasis on the word "minor." Tooth extraction usually takes just one visit to complete, and we perform the procedure under local anesthesia to ensure patient comfort. While complexity can vary depending on the specifics of the case, tooth extraction is usually a simple, fast, and convenient procedure, and in some cases it's the best option for achieving a beautiful smile. Usually, we use only local anesthesia to numb the mouth during a tooth extraction, although we may combine this with other sedatives like oral sedatives, nitrous oxide, or non-IV conscious sedation. Each of these methods helps to relax the patient and make the entire process more comfortable. If the tooth extraction is more complex, we may use more powerful sedation methods. It all depends on the patient. No matter what we use, though, we'll ensure that you feel comfortable throughout the procedure – and when the sedatives wear off, you won't even remember the surgery. Damage: If one of your teeth has been damaged or suffered dental decay to the point that it's no longer repairable, we may recommend removing the tooth and replacing it with an artificial tooth like a dental implant. Orthodontic Problems: For some patients, the jaws simply aren't big enough to accommodate all the teeth. In these cases, it may be necessary to remove a tooth to create more space in the dental arch, then use orthodontic treatment to straighten the remaining teeth and achieve a gorgeous smile. Impacted Wisdom Teeth: Perhaps the most common reason for tooth extraction, impacted wisdom teeth are a frequent occurrence. 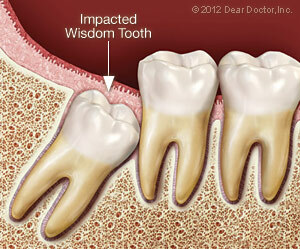 Even for severely impacted teeth, we can remove the wisdom teeth in a simple, comfortable procedure. Baby Teeth: Normally, we try to save baby teeth but if decay progresses far enough or if the baby tooth is preventing the eruption of an adult tooth, we may recommend pulling it. After we finish the procedure, we'll use a piece of sterilized gauze to cover the socket of the extracted tooth and control bleeding. In many cases, we'll also apply small sutures (stitches) to close the wound. We may apply stitches that dissolve automatically, or we may need to bring you back in to have the stitches removed. Tooth extractions are relatively painless, but many patients experience some swelling and discomfort following the procedure. We normally recommend eating only soft foods immediately after the surgery, then progressively adding hard foods back into your diet over the next few days. Many patients find that using an ice pack helps to bring down swelling after an extraction. 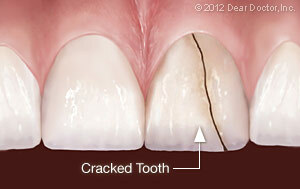 Once the area heals, we'll need to perform another treatment to completely repair your smile. We may recommend a dental implant, orthodontic treatment, or a dental bridge to replace the missing tooth – it all depends on your specific case. Your Maplewood dentist will explain the full range of treatments available to you and help you choose the one that's right for you. While we normally avoid tooth extractions, sometimes they're the best path to a beautiful smile – and if you think you might benefit from extractions or any other treatment we offer, we're here to help. Contact us today to learn more about our practice and schedule a consultation with us. We can't wait to hear from you, and we look forward to helping you achieve your dream smile!